Belize has become a leading destination for glamorous camping, or Glamping, with one popular Belizean eco-resort, The Lodge at Chaa Creek, recently receiving attention from a leading architectural digest for offering some of the world’s best “rustic-luxe” accommodations. The trend towards “glamping”, or glamorous camping, recently received notice in an influential architectural magazine and shows that even while roughing it, today’s travellers are seeking high quality accommodations that harmonise built environments with stunning natural surroundings, according to The Lodge at Chaa Creek. Chaa Creek’s general manager Bryony Fleming Bradley said that the July 5 2016 feature in “Architectural Digest” helps explain the popular Belize eco resort’s appeal to that growing number of travellers who want to get back to nature without compromising comfort. “There’s no reason to give up creature comforts in order to become immersed in beautiful, unspoiled natural surroundings. In fact, we’ve always believed that beautiful lodgings, fine food and quality amenities enhance the experience,” Ms Bradley said. “However, you need to strike a balance. The accommodations should blend in and harmonise with the environment and not overwhelm it with unnecessary distractions,” she added. The Architectural Digest article, “14 Rustic-Luxe lodges to Explore This Summer” by Andrew Sessa and Allix Cott, begins by explaining that “Embracing the great outdoors doesn’t always have to mean ‘roughing it.’ Thanks to these luxury accommodations around the world, camping has never been so glamorous. “Breathtaking views, modern comforts, and world-class service are just some of the perks you’ll find at these top-notch international resorts,” it continues, before recommending a variety of glamping destinations from Montana to Mozambique. “The Lodge at Chaa Creek is redefining the term glamping with over 35 years of experience in hospitality and luxe-treetop suites boasting panoramic views of the rainforest. Individually designed cottages feature handcrafted furniture and local artworks,” is how the authors describe the popular Belizean eco-resort. Ms Bradley said that glamping has been receiving more attention in recent years as more and more travellers wish to enjoy fine dining, quality amenities, interesting and healthy activities and what she described as “learning adventures” while they commune with nature. “These days, with time so precious, people want more out of their vacations. Instead of being passively entertained or just chilling out in exotic surroundings, they want more engagement; they want to engage in a more authentic way with the natural surroundings, the local people and cultures, and with each other through stimulating activities. Experienced travellers also have come to expect a high degree quality in their accommodations, dining and service, even when they are in pristine, natural settings. “Fortunately, Chaa Creek has been providing that sort of experience for over three decades now, with a range of accommodation options from luxurious suites enjoyed by guests such as England’s Royal Family to the more rustic Macal River Camp, with other suites, villas and cottage style rooms in between, she said. Located within a 400-acre private nature reserve (recently expanded from 365 acres), The Lodge at Chaa Creek has developed a reputation as Belize’s “Destination within a Destination, due to the range of onsite activities and amenities that include a fine dining restaurant featuring fresh farm-to-table cuisine sourced from the resort’s traditional Maya organic farm and Belize’s Caribbean coast, an internationally recognised Hilltop Spa, infinity pool, stables, canoe landing, full service conference centre, a Belize Natural History Museum, live butterfly exhibit and breeding facility and miles of well maintained trails for horseback and mountain bike riding, guided and self paced nature walks, as well as excursions to some of the 70 ancient Maya archaeological sites scattered throughout the property. Chaa Creek also organises tours to Belize’s most popular ancient Maya temples, ceremonial caves and other attractions, as well as offering a wide range of all-inclusive Belize vacation packages covering a variety of interests and budgets, Ms Bradley explained. A new Cultural Grand Tour, for instance, takes guests on a weeklong cultural learning adventure across the entire country, from inland jungles to a traditional Garifuna village on the Caribbean coast. “By developing slowly and organically as a family business over the years, we’ve created a distinctive ambience that harmonises with the beautiful natural surroundings we’re blessed with. We also developed a nationwide network of trusted colleagues that allows us to offer experiences that are unique and affordable. “My parents designed and built Chaa Creek from our small family farm on their own, without any sort of corporate atmosphere. In that regard, we’ve always felt that we do offer something special, something heartfelt and personal. And to be recognised by such a highly regarded professional publication as “Architectural Digest” is really gratifying. It shows that we, and our large family-oriented staff are doing something that resonates with people. “It’s a great feeling,” Ms Bradley said. 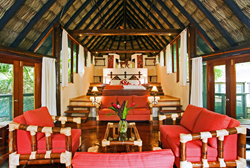 The Lodge at Chaa Creek i s a multi award winning eco resort set within a 400-acre private nature reserve along the banks of the Macal River in Belize.